Surgery to fuse the lumbar spine. 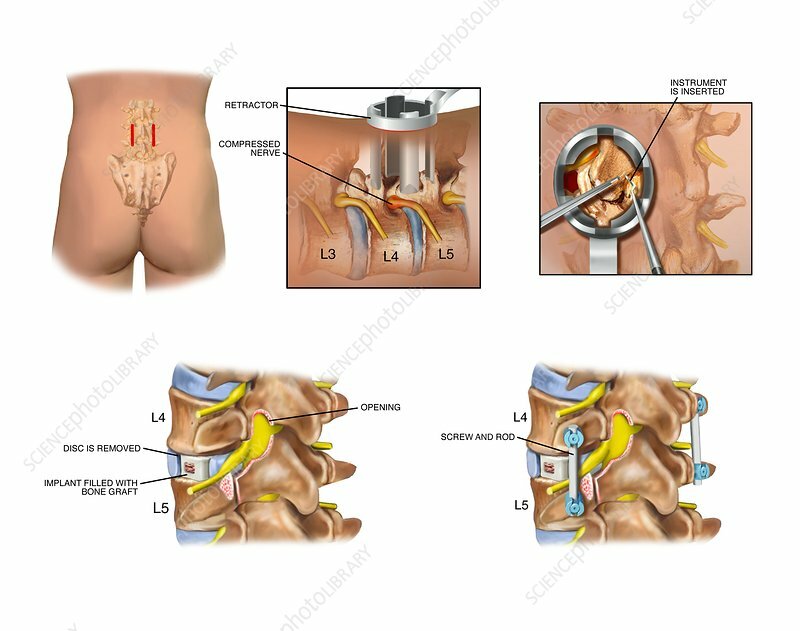 Sequence of artworks of an operation to replace the central portion of an intervertebral disc with an implant. This procedure, in the lumbar (lower back) region of the spine, is known as transformal interbody fusion. At upper left, two small incisions (red) are made in the patient's lower back. At upper centre (side view), retractors create a channel for surgeons to access the L4-L5 joint and nerve root (upper right, posterior view). At lower left, the central portion of the disc has been removed and replaced with a bone graft-filled implant. The final stage (lower right) is to insert rods and screws to support the spine.